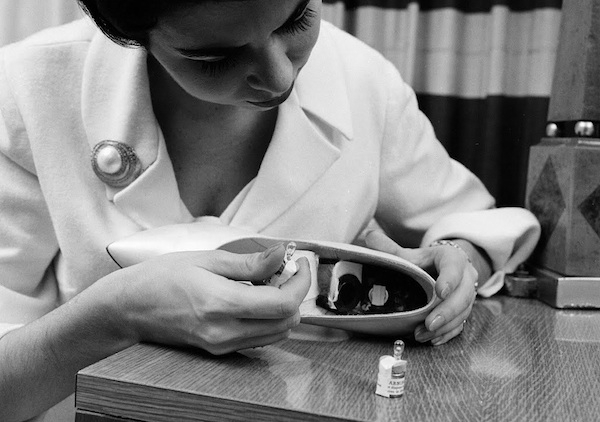 This invention relates generally to the shoe construction art, and more specifically to a novel illuminated heel for shoes, and to a novel light producing electric circuit which can be inserted in a shoe heel, and therein alternates, as the wearer walks, between light producing closed circuit arrangement and open circuit arrangement. The present invention provides a stylish shoe which has incorporated in it an efficient safety device. The light emitted by the novel shoe heel of this invention is readily visible in the dark, and provides a measure of safety for the wearer when crossing streets, waiting in darkened places and the like. It also provides an interesting effect when worn to parties and the like. 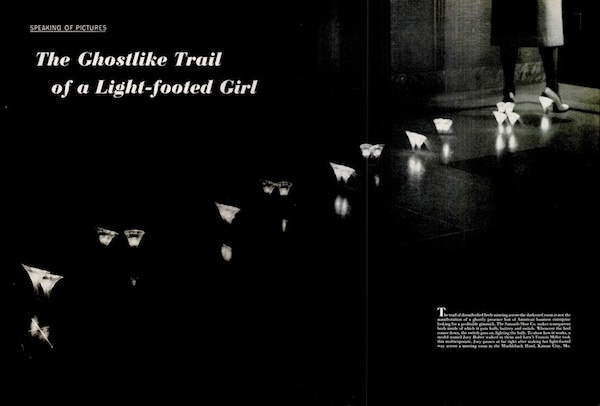 "The interesting effect when worn to parties" caught the attention of LIFE's photographer Francis Miller and the illuminated heel gained a two-page spread titled "The Ghostlike Trail of a Light-footed Girl". The trail of disembodied heels mincing across the darkened room is not the manifestation of a ghostly presence but of American business enterprise looking for a profitable gimmick. 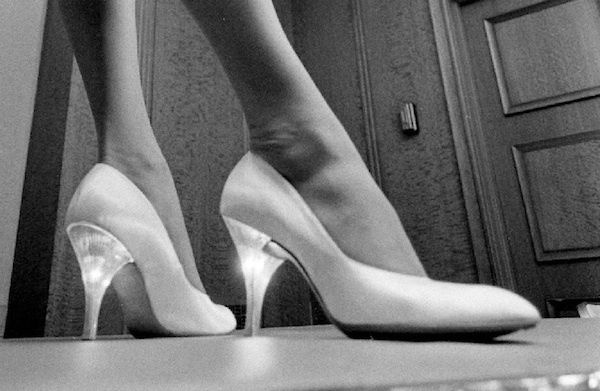 The Samuels Shoe Co. makes transparent heels inside of which it puts bulb, battery and switch. Whenever the heel comes down, the switch goes on, lighting the bulb. To show how it works, a model named Joey Holter walked in them and LIFE's Francis Miller took this multiexposure. 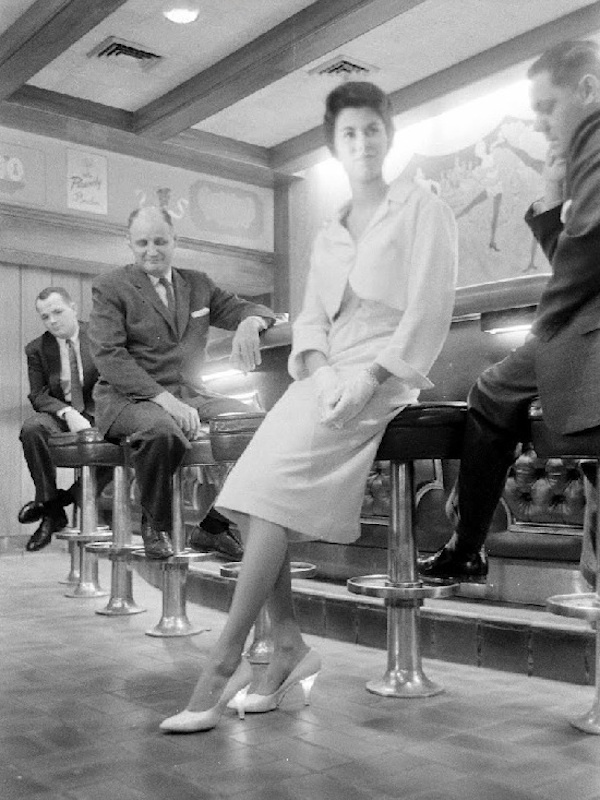 Joey pauses at far right after making her light-footed way across a meeting room in the Muehlebah Hotel, Kansa City, Mo. 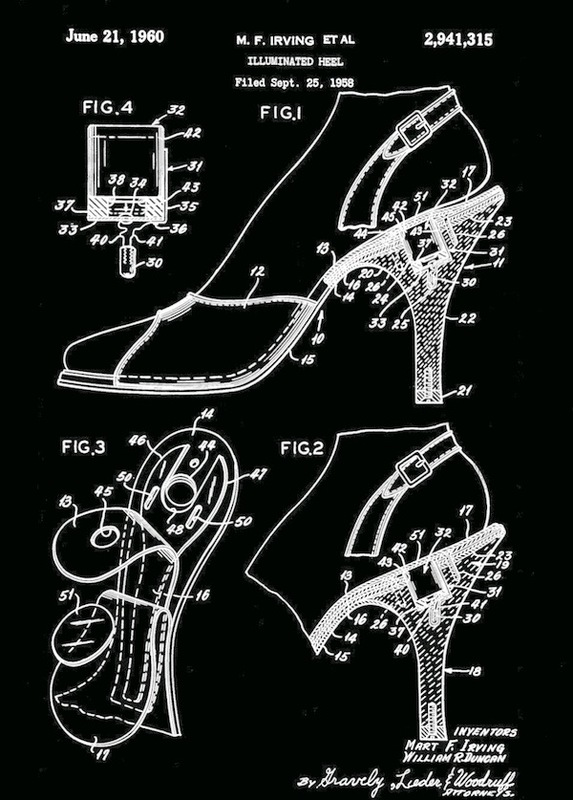 The two inventors licensed the illuminated heel to the Samuels Shoe Co. and missed their 15 minutes of fame. It is now possible to correct that thanks to Google Arts & Culture who made available part of the LIFE Photo Collection: a few more photographs of the photo-session illustrate how to use the illuminated heel, repair it or just look cool in it. Interesting enough, the Irving/Duncan patent quote a 1954 Italian patent which, unfortunately, can't be found.